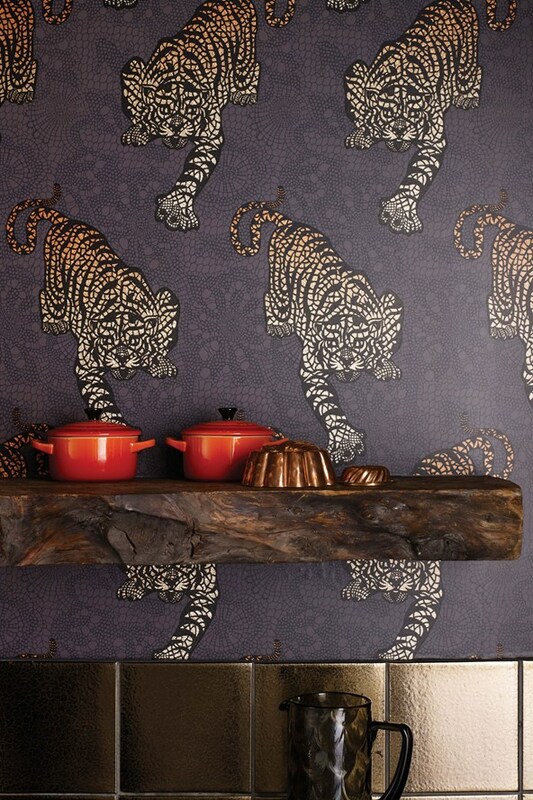 Make a dramatic statement by using wallpaper. You could use designs on their own or combined to create your own personal work of art! One of the benefits of using wallpaper is that you have an extensive variety of options, textures, colours, designs and patterns to choose from. Wallpaper can hide blemishes in the wall’s plaster. It lasts a good deal longer than paint. It creates an amazing variety of effect and changes the entire look and character of the room. [dc]A[/dc]s we express our individuality and creativity in our personalities, so we wish it in our living spaces. We live in a world today that is ever changing. People lead lives that are extremely diverse. We, as designers, have to adapt to the concept that people today demand to be treated as individuals and therefore have to be flexible in our design decisions and choices for them. Baker – the Homes and Gardens Collection. From Floral designs to Rich Eastern inspired Paisley to Crackle-Glaze and Ming. Contemporary/Geometric and elegant stripes. Harlequin – the Poetica range. An enchanting homage to the natural beauty and intrinsic charm of England’s spectacular countryside and delightful cottage gardens. They include botanical studies of daffodils, magnolias, poppies etc. An array of distressed textures and effects, giving the collection a modern edge. Delicate colour palette, from pared down vintage hues to sultry shades. Elitis presented a new collection at Maison & Object in Paris this year. He wanted to offer a more colourful and innovative collection, that he felt was missing when he first started. There was twinkling gold and silver, vintage leather and suede with a 70′s effect. A collection of handmade mural silk shantung – refined, elegant, in bright colours. Romo launched the Black Edition earlier this year. This stunning range originated from couture fashion. 20th Century Abstract Art, Folk embroidery, Indian Ikat designs and Byzantine glass mosaics. With the hand painted look, ombre’ shading and aged old artisan techniques. The Collection has a sense of faded grandeur, whilst the vibrant colour and subtle use of metallic yarns keeps the overall feel sophisticated and modern. Wall coverings – using texture, bold, geometric, faux, subtle, colour, contemporary flocks, digital florals, metallic damasks, shimmering beads, – the diversity of wallpaper is here to stay.